Warrington Wolves players Josh Charnley and Jack Hughes have been selected in the 30-man England performance squad. 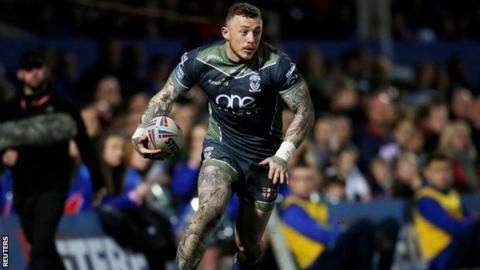 Winger Charnley, 27, is included for the first time since switching codes back from rugby union in 2018 after spending two years at Sale Sharks. Super League's top two sides, St Helens and Warrington, each have six players included, while Castleford have four. "I know the guys will be looking forward to getting together again in April," head coach Wayne Bennett said. "We had a good year in 2018 with four wins out of five, three of them against the Kiwis. "Hughes is one of a few players who have come up into the EPS from the Knights squads that were picked last year, which is good to see." The EPS will meet up in late April, when they will be joined by the England Knights development squad, which will be named on Tuesday. There are further meetings planned for August and September ahead of the Great Britain Lions tour of New Zealand and Papua New Guinea this autumn and England's participation in the Rugby League World Cup Nines in Sydney in October. L Gale, A Milner, J Trueman, L Watts (all Castleford), S Tomkins (Catalans Dragons), J McGillvary (Huddersfield), J Connor, J Shaul, S Taylor (all Hull FC), R Mulhern (Hull KR), S Ward, K Watkins (both Leeds), J Lomax, T Makinson, M Percival, J Roby, L Thompson, A Walmsley (all St Helens), T Johnstone, R Lyne (both Wakefield), J Charnley, D Clark, B Currie, C Hill, J Hughes, S Ratchford (all Warrington), O Gildart, J Greenwood, S O'Loughlin, G Williams (all Wigan).